Because of abundance, consumption by the majority of the European population has been higher than required for basic needs. Consumption of some products and services has been even higher than their usefulness, and in many cases even higher than environmental sustainability allows. On average, a household member in Slovenia spends most funds on transport and communication (20%), somewhat less funds on food and non-alcoholic drinks (14%), even less on recreation, culture, education, restaurants and hotels (12%), and spends the least on dwellings, electricity and other fuels (11%). In total, the average expenditure per household member in Slovenia in 2007 amounted to 7,142 EUR, which is 66% more than in 2000. The indicator shows the changes in the structure of household consumption expenditure with regard to the average annual budget for an individual group of goods or services, thus enabling the tracking of the changes in consumption patterns. To improve the environmental and energy attributes of products sold in the European Union, to adopt a life-cycle approach in production and green tariffs, to provide better information to the consumers, and to encourage the Member States to introduce green public procurement. With the growth of incomes, consumption expenditure has also increased. Because of abundance, consumption by the majority of the European population has been higher than required for basic needs. Consumption of some products and services has been even higher than their usefulness, and in many cases even higher than environmental sustainability allows. Household consumption patterns are shaped by an array of interdependent economic, social, cultural and political driving forces. The following are among the most important in Europe: growing incomes and well-being, globalisation of the economy with the opening of markets, increasing individualism, new technologies, targeted marketing and advertising, smaller households, etc. Households present an important part of the production-consumption chain, as household consumers play an important role in their daily selection of goods and services. Although the environmental impact of each household is relatively small compared to that of production activities, numerous households are major contributors to environmental problems. As individuals or households, we affect the environment through our choices of where and how to live, where to work, how to spend our leisure time, and which means of transport to use. Most often, our choices are made with certain boundaries conditioned by historical developments and past policy decisions, for example on urban planning, transport infrastructure and available housing. However, even within the existing framework, it is possible to find a more balanced way of life. According to the data provided by the Statistical Office of the Republic of Slovenia, a household member in Slovenia spends, on average, most funds on transport and communication (20%), somewhat less funds on food and soft drinks (14%), even less on recreation, culture, education, restaurants and hotels (12%), and least on dwellings, electricity and other fuels (11%). While the expenditure of household members on food and drink has decreased by 4% and on clothing and footwear by 1.3%, the expenditure on dwellings has increased by 0.8%, by 1.6% on communication and by 0.4% on recreation and culture. In 2007, the total average expenditure per household member in Slovenia amounted to 7,142 EUR, which is 66% more than in 2000, when consumption expenditure amounted to 4,295 EUR. In the EU-25, the expenditure on transport and communication, dwellings (including utility payments), recreation, health, and education is growing the fastest. 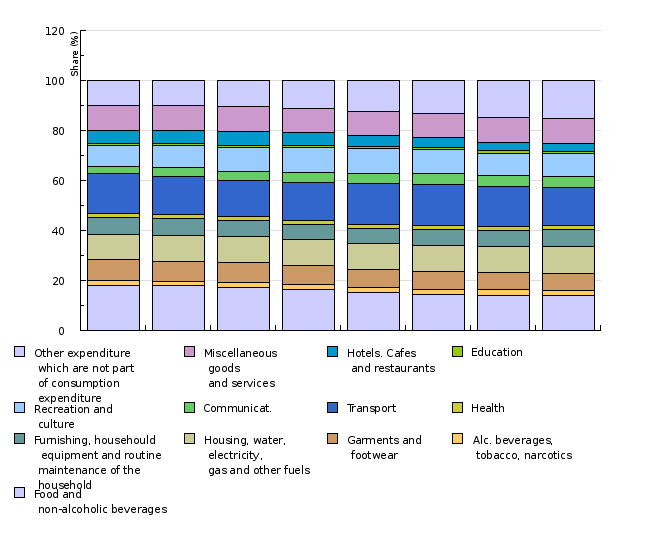 In the EU-15, recreation presents the second largest area of household consumption. Consumption patterns of the EU-10 are moving closer to those of the EU-15, showing that lifestyles are changing and, in general, the incomes available are rising. Similar to Slovenia, the EU-25 have also noted a decrease in household expenditures on food, despite the rising incomes. Between 1995 and 2005, the share dropped from 14.4% to 12.5%. Only in the last fifty years, one person has used more goods and services than the entire planet's population had ever before. Our enormously productive economy has led to consumption becoming our way of life and shopping a ritual that provides relief from our personal problems; shopping centres have become places to meet friends and acquaintances. With the development of excessive consumption, we have contributed to the existing situation in which the economy has been producing increasing quantities of various products. The increasing trend in purchasing power and the growing of funds earmarked for advertising have created a never-ending circle of shopping or consumption. Consequently, the distinction between these interdependent phenomena of consumption and production is becoming increasingly blurred. 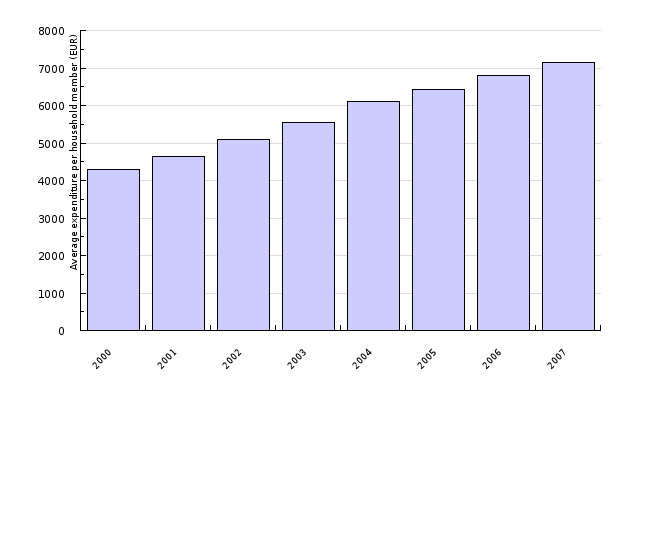 Source database or source: SI-STAT Database (Household Budget Survey). Methodology and frequency of data collection for the indicator: The Statistical Office of the Republic of Slovenia collects data on consumption expenditure through a questionnaire entitled 'Household Budget Survey'. 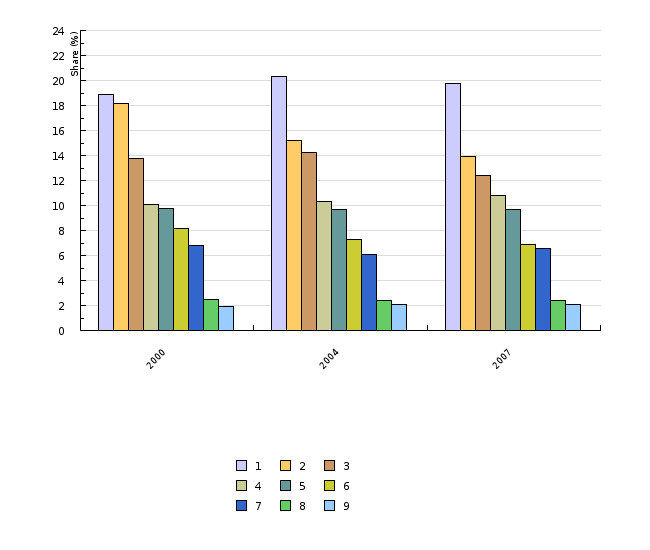 Data for the period of three years has been calculated to the middle year and taken into account in the interpretation of the results for the reference year. The data is published on the SI-STAT Data Portal, under the Chapter: Demography and Social Statistics, Level of Living, Household Budget Survey, Average annual allocated assets of households (consumption structure per household member and average consumption per household member (EUR)). Consumption expenditures (the concept of consumption expenditures) are classified according to the COICOP – Classification of Individual Consumption by Purpose. Data processing methodology: The data for the Structure of Household Consumption Expenditure is provided for the first, the last and the middle year available.